Need new set plays for your team ? Watch this !!!! This drill emphasizes aggressiveness, footwork, shot-making and conditioning. Place a chair on both sides of the foul lane in the low post position, about 4 feet outside the lane. Place a 3rd chair in the middle of the lane, jut below the foul line. Place a ball on each chair (can also be done with 2 balls or 1 ball, depending on players available to rebound). Player starts under the basket. Player cuts to the left chair, picks up ball and makes a low post move. Player cuts to baseline and then to the right chair. Player picks up ball and executes a low post move. Player cuts to baseline and repeats the series. Here is a basketball drill that will allow you to improve your shooting while also improving some of the other subtleties that separate good players from bad players. This basketball drill features high shot repetition, intensive pivot work, effective ball handling, agility and conditioning. Pick 10 spots on the floor that you feel you will shoot from in your games. There should be 5 spots on one side of the basket and the same 5 on the other side. It is very important that you work on both sides of the basket. Start under the basket with the ball. Toss a "spin out" to the first spot. A "spin out" is a toss of the ball on which you put significant backspin on. The backspin will force the ball to bounce up in the air instead of rolling away. After tossing a spin out, chase the ball and catch it on the first bounce. Use a right foot pivot to square to the basket. Once squared, shoot the ball. After shooting the ball, sprint after the rebound. If the shot missed, put it in the basket on the rebound. After rebounding, spin out to the 2nd spot, pivot and shoot. After rebounding, spin out to the 3rd spot. Continue until you have shot from all 10 spots. Once you finish the 10th spot, start again, going back the other way, using a left foot pivot. After shooting from the 10th spot, go to the foul line and take 5 foul shots. After your foul shots, begin again, using a different pivot. Take 5 foul shots in between each rotation. After using all your pivots, continue the drill using 1 dribble moves. Make the same move from all 10 spots, going both ways, using both pivot feet. Set a goal of 300 shots, which would be 15 rotations going in both directions. That will also give you 75 shots. Pivots to practice (using both feet as a pivot foot) – Front pivot, inside pivot, drop-step to inside pivot. Dribble moves to practice – Jab and go, crossover, rocker. 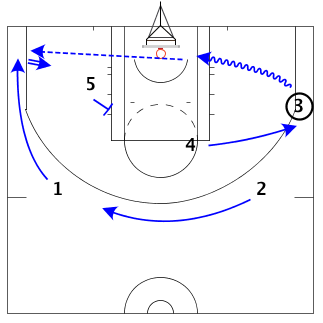 The first basketball play on today’s post involves a screen/rescreen into an isolation. 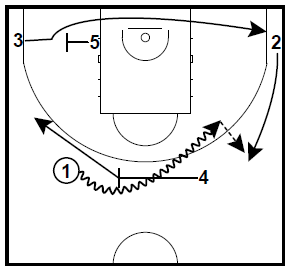 Rescreening actions are difficult to get unless you run a set play and in my opinion are very difficult to guard. The second involves 2 ball screens and a dribble hand off. 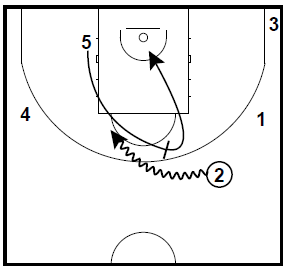 These 2 plays are from Scott Peterman’s Euroleague eBook bundle that contains over 170 Euroleague sets including guard post up plays, plays to post a big, motion and pick and roll sets, SLOBs, BLOBs, and many other actions. 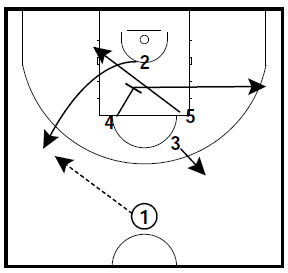 4 sets a ballscreen for 1 and pops out to the left wing. 5 sets a cross screen for 3. 3 cuts baseline side to the right corner. 2 slides up to the right wing. 1 attacks 2 for a dribble hand-off. 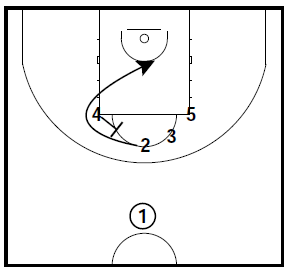 5 sets a ballscreen for 2 and rolls to the basket. 2 pops out to the left wing. 4 pops out to the right wing. 3 pops out to the top right guard spot. If 5’s defender comes at him, 2 will pass to 5.
big, motion and pick and roll sets, SLOBs, BLOBs, and many other actions. This drill simulates pressure free throws at the end of a game and emphasizes the damage done by missing free throws late in a close game. Run the drill at the end of practice to more closely simulate the mental and physical fatigue form the end of a game. 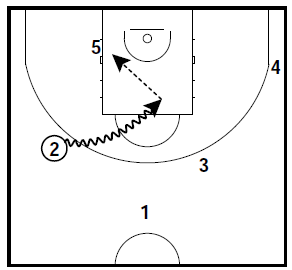 Line up the team in the lane spaces and behind the arc as they would for a free throw attempt. The shooter gets a 1-1 opportunity. Put a realistic score on the scoreboard that you would have in the final minutes of a close tournament game, whatever fits your level. We put the score on the scoreboard at 45-44 for high school varsity with our team leading by one. If the shooter makes the shot, your team gets one point added. If the shooter misses, the opponent gets two points added. That emphasizes the importance of each miss. After one shooter is done, rotate until each player has had a chance to shoot. If the game ends in a tie, then have an overtime where only the players who missed the first time shoot. If the first shot of the one and one is missed, count it as two misses since the player does not even get to attempt the second shot. That would be 4 points for the imaginary opponent. Start off with the score tied rather than you being ahead. That takes away from the protecting the lead theme, but if you obviously are going to get fouled with a tie game at times, especially if you attack the basket. Start out behind by a few points to emphasize attacking the basket late in the game to get fouled and catch up with the clock stopped. Run sprints prior to or between the free throw attempts to increase fatigue. Start out with a bigger lead. Shoot one shot rather than a one and one each time. Each miss is only one point for the imaginary opponent. The drill is a You Tube video, so to be able to watch them, you will need to be able to access You Tube on the server that you are on. You’ll know that you’ve won when your friends say it’s true. “I like who I am when I’m around you. It’s giving your parents the message “I care. It’s trying and doing, not crying and stewing. The more that you give, the more you’ll receive! Teaches footwork, shooting on the move, change of direction, explosion to the basket. Place a chair at the right elbow. Place a 2nd chair outside the 3-point line; a little higher than the chair above the elbow. Put a ball on each chair. Player starts on the right block. Player cuts up the lane, inside the chair. Player scoops the ball and turns outside the chair for the jump shot. Immediately after jump shot, player cuts to 2nd chair. Player picks up ball from 2nd chair, executes a pivot (step-thru, drop step, inside pivot, etc.) and makes a direct 1 dribble lay-up. If a re-bounder is available (2nd player/coach), the re-bounder retrieves the balls and hustles to replace the balls on the chairs. This will allow the shooter to work continuously. All you need is here !